No dental restorations have been performed on Laws' teeth. 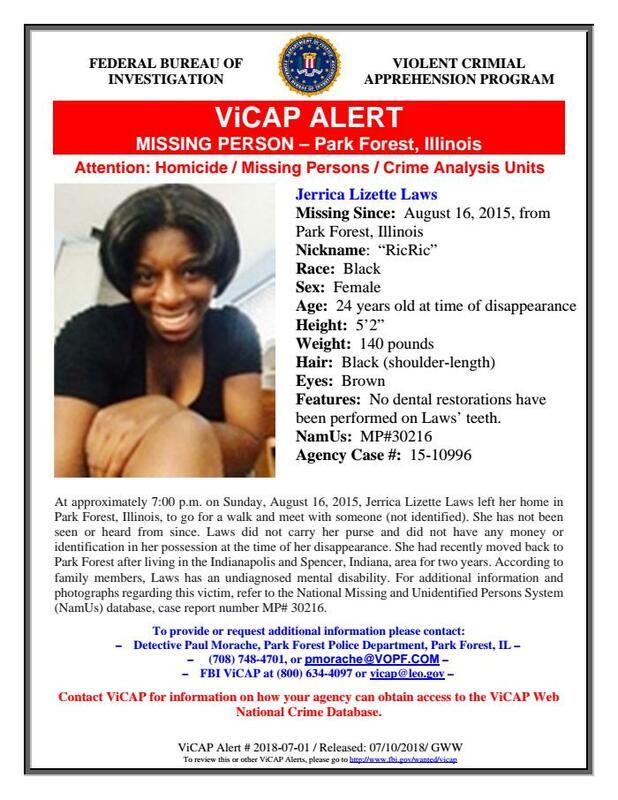 At approximately 7:00 p.m. on Sunday, August 16, 2015, Jerrica Lizette Laws left her home in Park Forest, Illinois, to go for a walk and meet with someone (not identified). She has not been seen or heard from since. Laws did not carry her purse and did not have any money or identification in her possession at the time of her disappearance. She had recently moved back to Park Forest after living in the Indianapolis and Spencer, Indiana, area for two years. According to family members, Laws has an undiagnosed mental disability.